Today is Thursday 22nd January- and the third and final day of the Share Fair. For the first session of the day I am attending the session on ‘Assessment methodologies and learning for policymaking’ being convened in the India Room. The session invovles the presentation of a group from FAO including Stephan Baas, Claudia Hiepe and Selvaraju Ramsamy. Their presentation is on Livelihood adaptation to climate change- a socio-institutional learning process: experiences from a project in Bangladesh. The session will be run as a peer assist as the group would really like to get some feedback and ideas from those attending the session on their project and tools. First they introduce the context by showing a film looking at the effects of climate change in Bangladesh and some interventions that FAO has been undertaking there. The project wanted to build on existing processes and make use of them for promoting learning and doing dissemination around climate change adaptation. 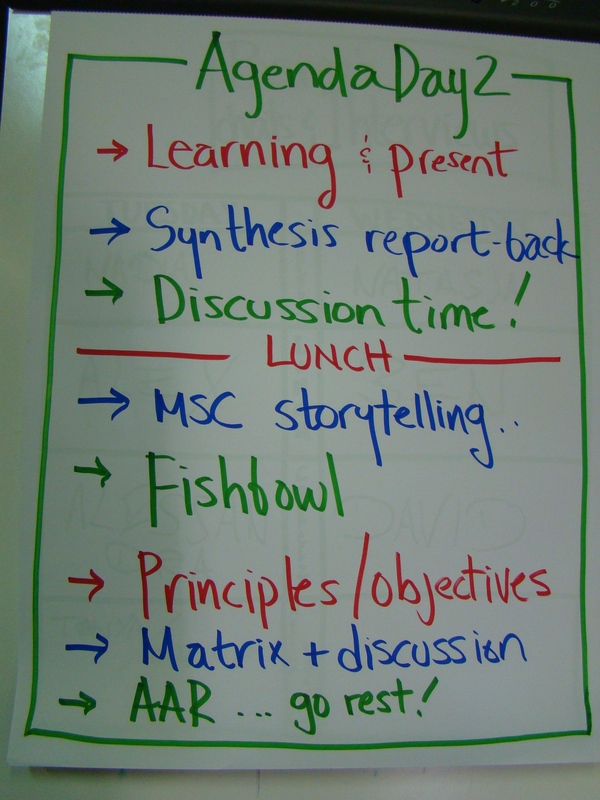 One example of this was using existing Farmer Field schools and making them into Climate Field schools. Then Salvaraju showed us the online tool that has been developed as a training tool. It was developed out of a need for a more interactive e-learning tool since it is not possible to reach all extension agents with face-to-face training programs or even published materials. The tool was developed also as a way of fitting into the technology transfer process that is being carried out by the extensionists. The project found that when they tested out the tool with some extension agents the feedback they got was that the extension personell needed some exposure to working on computers as many of them don’t have much experience in working with computers. *how to institutionalise this issue. 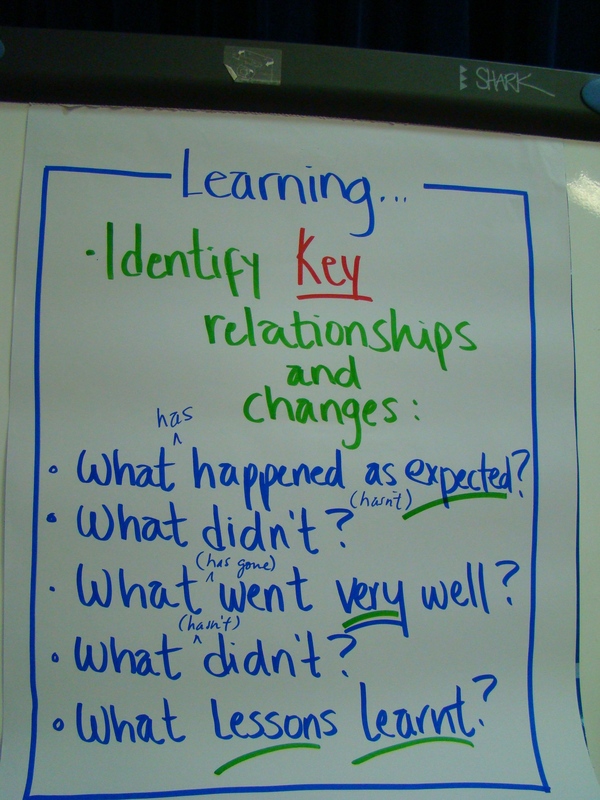 Working through extension but struggling with the question of how to do this more effectively and sustainably. Sometimes people go back to business as usual–and just go back to old ways of doing technology transfer and calling it adaptation to climate change—so how to keep them on track. One of the big questions that came up in the discussion was really what are the best ways to share knowledge and make effective linkages with the policy makers. This is something that many projects have as an aim but do not know what approaches to follow. It is not easy! Learning from successes in agricultural development is now more urgent than ever. Progress in feeding the world’s millions has slowed, while the challenge of feeding its future millions remains enormous and is subject to new uncertainties in the global food and agricultural system. To learn and share lessons from past successes, IFPRI, with support from the Bill & Melinda Gates Foundation, is leading an initiative titled “Millions Fed: Proven Successes in Agricultural Development” to document evidence on what works in agriculture—what sorts of policies, programs, and investments in agricultural development have actually reduced hunger and poverty. IFPRI invite nominations highlighting interventions that have had a significant impact on food security, including those that have empowered women and vulnerable groups to improve their livelihoods. Nominations may include, for example, research and extension programs that have improved on-farm yields and outputs for small-scale farmers; public investment programs that have helped food-insecure consumers meet their daily nutritional requirements and accumulate assets; community-led efforts that have conserved soil, water, forests, and biodiversity; or market-based interventions that have strengthened the ability of small-scale farmers and food-insecure consumers to gain access to production inputs, rural services, and agricultural commodities. Learning is also about celebrating successes! The International Water and Sanitation Centre-IRC, is one of the partners in the IWMI lead Wastewater, Agriculture, and Sanitation in Poverty Alleviation (WASPA) project which is using a Learning Alliance approach in the two project sites: Kurunegala, Sri Lanka and Rajshahi, Bangladesh. IRC has been championing, supporting the use of and learning about Learning Alliances in a number of projects around the world. 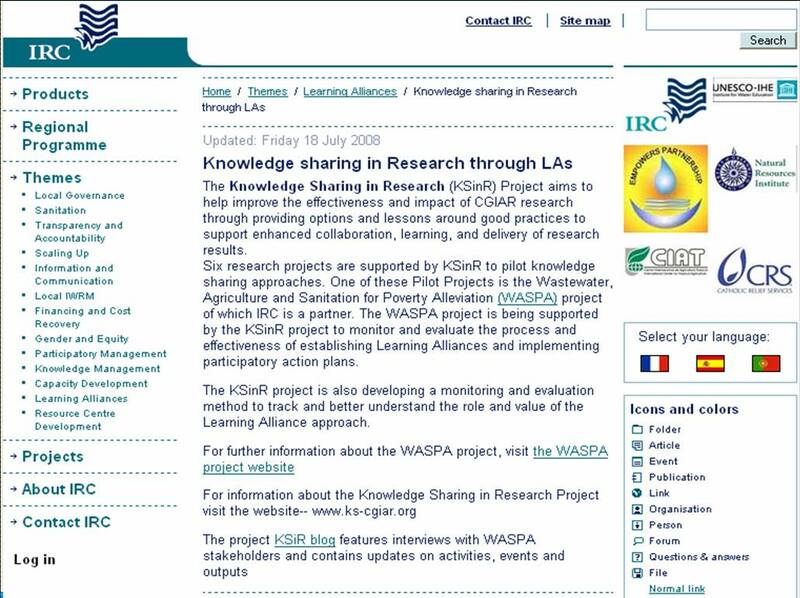 Given the common interest in better understanding the use and value of such a knowledge sharing approach as Learning Alliances–IRC and KSinR have linked up and are trying to establish some joint activities around learning and communicating about Learning Alliances. The Institutional KS Project has started to undertake an evaluation study of project phase I (2004-2006). The Project Team of the first phase undertook a self–assessment, which provides the background for the proposed study and can be considered as its starting point. An independent evaluation of those experiences should help us to explore an entry point for the development of a monitoring and evaluation (M&E) framework for KS. We have recently identified a consultant for this activity, Bernhard Hack. Discover the evaluation concept and Bernhard’s bio on our Web site.